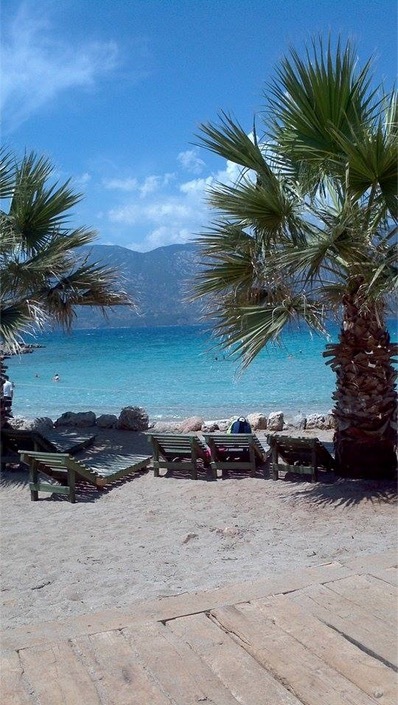 After a lovely but quite an exhausting day in Turunç and İçmeler, I was going to spend my third day in Marmaris on a boat tour to Gökova Bay and Cleopatra Beach- Cedar Island. I woke up at around 7.30 in the morning for breakfast before I got picked up by the tour company from the hotel at 8.45am. The tour was planned to start at 10 am and end at 6 pm but they arrived much earlier than the scheduled time as they were going to pick up other tourists from different locations. These tourists that were on the tour were mainly British and Russian and I do not know if there were other nationalities, as all I could hear was English and Russian. We arrived at the big bus that was parked near the main Marmaris Bus Terminal after getting people from different locations and it felt like a nice little ‘residential areas’ tour of Marmaris. Then we drove up to the little harbor called Çamli where our wooden tour boat was docked, through a couple of small villages. 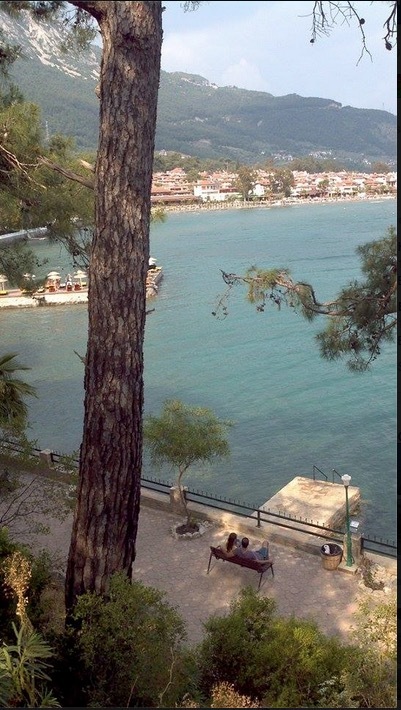 This part of Marmaris is also really beautiful, very lush and natural with pine trees. Please note that these boat tours are quite popular and they tend to fill up quickly in peak season. So it is recommended that you make your reservations two to three days in advance, especially during the months of July and August. And in other months like May, June, September, and October, one day in advance is usually enough. But it could still be rather busy as the boat I went on at the beginning of May was full. And it is best if you check the weather forecast from the internet. You are not going to enjoy it if it is going to be windy, rainy or cool as the sea will also get wavy. 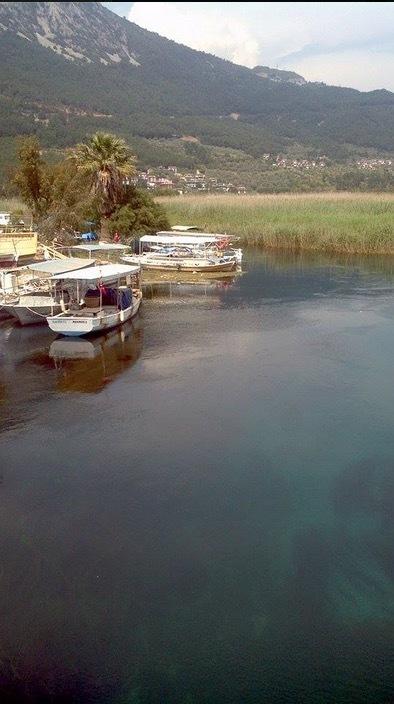 These tours are also organized in Içmeler and they will pick you up from the hotels both from Marmaris and İçmeler, to take you to the main big bus for Çamli Harbour and the boat. You’ll find that they organize two types of tours, the more expensive one includes unlimited drinks and the cheaper one does not and that’s basically the only difference. What they both include are lunch on the boat, guidance, insurance, and the entrance ticket fee to Cleopatra Island. If you think you’re a drinker the difference would be worth paying as the drinks are not going to be cheap on the boat. Otherwise, there is no need to pay extra and be careful with the tour companies trying to sell you the more expensive option you may or may not need. On the day I went on the Cleopatra Island tour, it was nice and sunny with a bit of a breeze. The sea looked magnificent- very clear and clean and was just inviting us to jump in all the time. The water is much cleaner and clearer than what you’ll find in Marmaris Bay, even though it was a little cool. I liked that it was colder than the air as it felt quite refreshing each time I went for a swim. 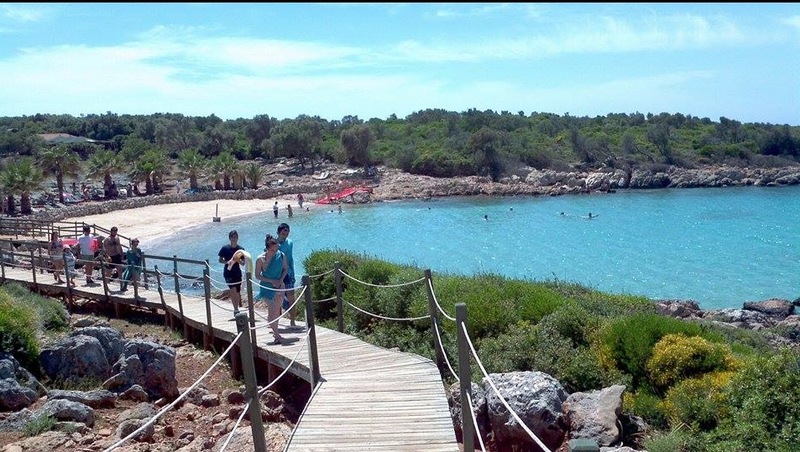 Cleopatra Island is the last stop of this daily tour and before you reach there, you stop at three other bays. And the lunch is served in between, which is something like pasta, chicken, and salad. I wasn’t really hungry after a large breakfast buffet at the hotel, but it still tasted fine. I had to eat as I was swimming and moving around heaps and there was still plenty of time until 6 pm. Then before the boat docked at Cedar Island where Cleopatra Beach was, we were given our tickets so we could enter the protected zone. 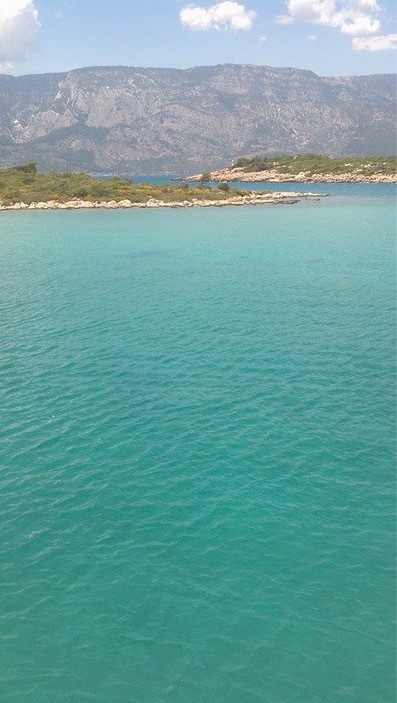 What I was seeing around me, the color of the water, the landscapes and the island itself was just amazing. 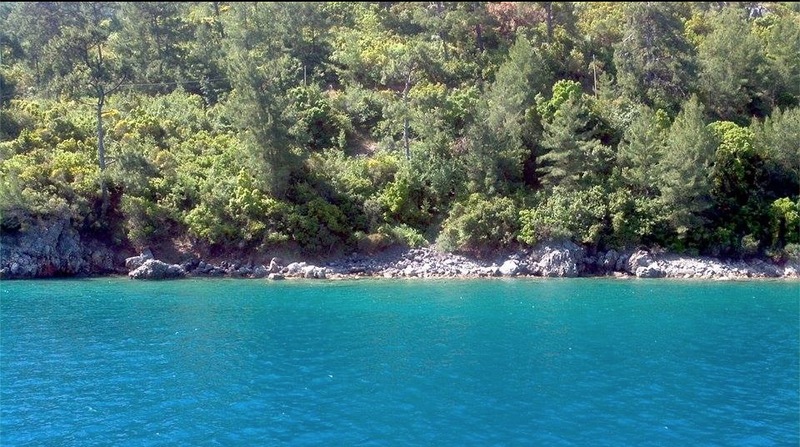 There is even an interesting story- the legend of the ancient Cedrae (Kedrai), the Cedar (Sedir in Turkish) Island. Cleopatra was the last queen of Egypt, and her lover Antonius (Mark Anthony), was the general who was responsible for the Eastern Rome, was based in Tarsus in the south of Turkey which was part of the Roman Empire at the time. Cleopatra came to visit Mark Anthony from Egypt and they went to this Cedar Island together. She was swimming in the beautiful cove where Cleopatra Beach is located today. She was surprised that there was no sand on this beach, though. So Antonius got ships loads of pure white sand brought over from Egypt for Cleopatra. We do not know if this is a true story or just a legend, but still interesting enough and both the beach and the island are quite nice. You will find that there is a security personnel guarding this very special beach that is under the protection of Turkish government. Because this kind of sand is found only in Egypt and here on this beautiful island. And there are other people working on the island for the protection and maintenance of the ruins of the ancient city Cedrae. 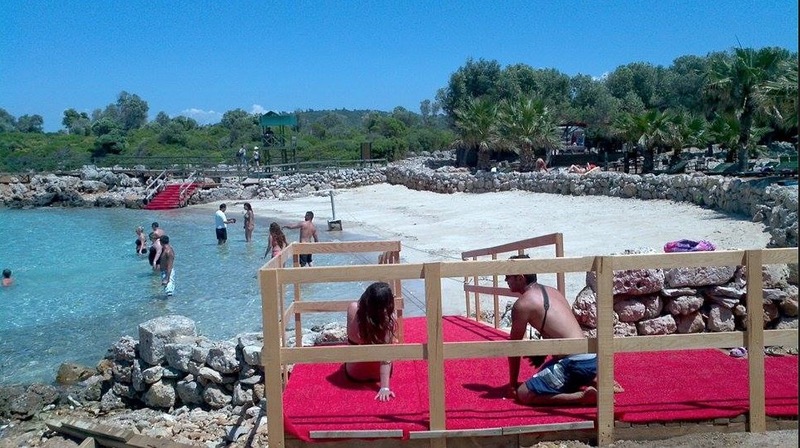 No one is allowed to walk or sunbathe on the special white sand on the beach. 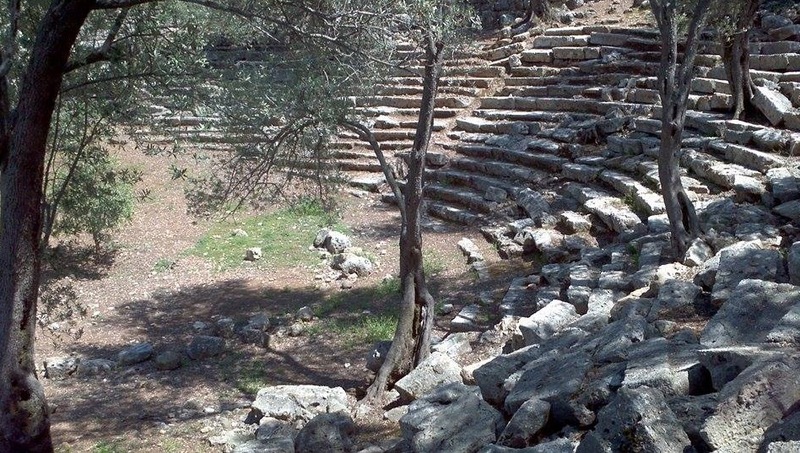 Cedrae is a part of an island group of three islands in Gökova (Kerme) Gulf, and all have antiquities but Cedrae is the largest of them with the best-kept ruins. 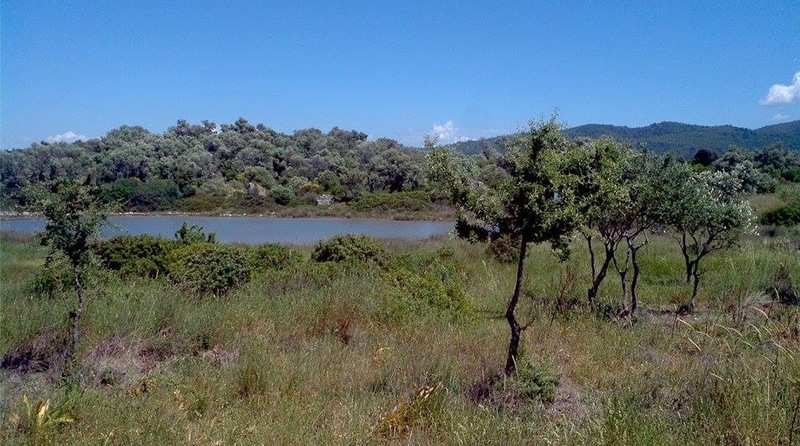 The reason why this pretty island is called Cedar Island is that it was full of cedar trees for a long time and these were replaced by pine and olive trees. The name remains as Sedir (Cedar) and here you will see the ancient city walls and a small antique theater that belongs to the Roman Empire period. These are not just a couple of crappy Roman ruins either, there is quite a bit to see and I find the island rather impressive. I really enjoyed swimming in Cleopatra Cove too despite the small waves in the sea, and the beach was lovely. We stopped at a total of four beautiful coves, and this Cedar Island was the last stop. We returned to Camli Harbour to take the bus back to Marmaris. And we were dropped off at our hotels in a smaller minibus like the one that picked us up in the morning. It was a very beautiful day indeed. There are quite a few half-day and full day boat tours you can do around Marmaris. And because I only went on this Cleopatra boat, I can not compare it with others. The Cleopatra one was pretty decent. I’ve only had one more day left in Marmaris, before heading off to Bodrum the next day and I reserved that day to Akyaka. I had a very long day on the boat in Gökova Bay and I was quite tired and I didn’t do anything other than grabbing something to eat. The next day I woke up at 8.30am in the morning, had breakfast at the hotel and went to the Marmaris Bus Terminal for taking a bus to Akyaka. There are no direct buses to Akyaka that time of the year and I doubt there would be in peak season. You need to take the bus that goes to Muğla from Marmaris. You just get off at the Akyaka Junction on the main road and you walk down into Akyaka center. 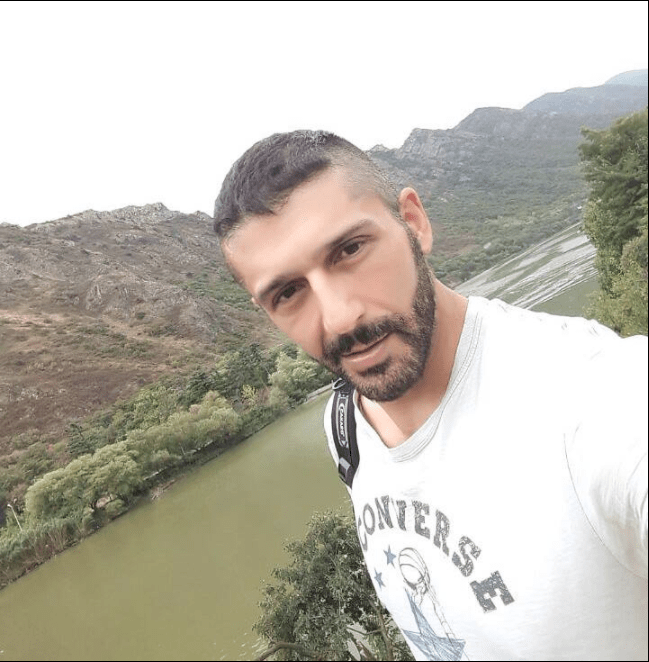 It is not a long walk at all and being downhill it is easy enough to walk and the views over the valley on the left side of Azmak River is spectacular. So I was admiring the beauty of the landscapes again and took a couple of photos. I am traveling solo again and I do not have a car, nor rented one. And I tried to walk as much as I could. Because I had to lose 5-6 pounds of weight and I would have only gained more weight with the buffet meals at the hotels. As you approach Akyaka, you realize this town has quite a character of its own with its architectural style as well. The houses looked very nice and there were no apartment buildings. Akyaka is very small as compared to Marmaris, with a winter population of just over 1500 that goes up to 4000 in summer. It is located at the far end of Gökova Bay and is one of the 29 districts that are part of the Ula town. Although there is another small town called Gökova further down, Akyaka is also often called Gökova. It has a pretty long and sandy beach that is often full of people. But the crowd here is mostly Turkish tourists and I didn’t see many foreigners, which is the exact opposite of Marmaris. This is a nice sandy beach but the sea was rather wavy and looked a little hazy. Akyaka is a very pretty small town, is very green with lots of pine trees, has a beautiful national park, the Sakartepe Mountain that reaches up to 1km of altitude and there is the Gökova Plain on one side. In the spring, you can observe many different types of birds in the reeds. 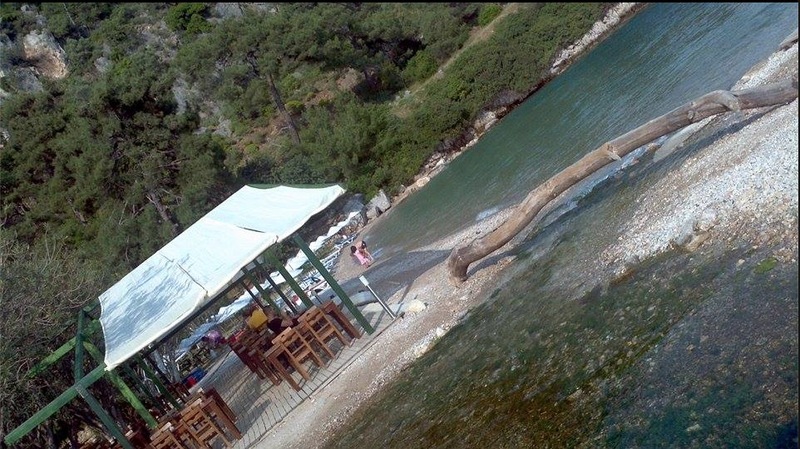 I didn’t get on Akyaka Beach as it seemed crowded, and the water didn’t appeal to me much. I went directly to the Azmak River on the left and that was really nice. It had a couple of bridges, cafes on the edges, the water was very clear and was flowing slowly into the sea. It was super fun swimming here in the same direction as the current. I absolutely loved it. Then I walked to the other side of the main Akyaka Beach and found a little cove with very clear waters and continued swimming here. The sea had the clarity of a swimming pool and I could see the little fish swimming. The water was a little cool but I couldn’t resist it and jumped in. 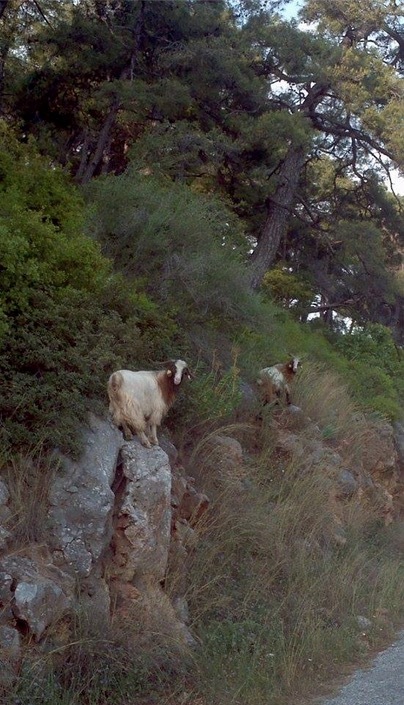 Then I walked through Akyaka National Park, filled with magnificent pine trees and goats on the sides of the roads, and reached the Çinar Beach which was about 3km from Akyaka town center. This looked like another nice spot and had the feel of a more upmarket place with eating and drinking facilities and sunbeds. The beach was not sandy here but had pebbles instead, the water was free of waves and very clear. I walked back to Akyaka and then took a bus back to Marmaris. On my way back to the hotel, not far from the bus terminal, there is a famous cheap eating place for the locals called “Yiğit Lokantasi” and people are literally queueing up at lunch and dinner times. It is very cheap but the quality of meals is very high for the price. You can find all sorts of authentic Turkish meals, like Turkish pizza, Iskender, stews, desserts, and many others. Then I walked back to my hotel for a rest. This is how I ended my last day in Marmaris and I was very satisfied with the day out again. I talked a bit about what I thought of Marmaris in general in my previous Marmaris post, and you can find more details about the town itself. The following day I was off to Bodrum to stay there for three nights, at the 4-star Gumbet Club Shark Hotel near the center of Bodrum. I was certainly looking forward to that.